Had a lovely weekend out in Port Angeles where I was on child wrangling duty, in support of the lovely wife who had a thing this weekend out there. 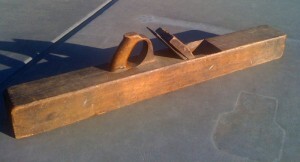 While we were there, I spied this nice old jointer plane in an antique store. He looked lonely but I didn’t really need another plane (shhh… for the sake of the story, just go with it…) We left the store, but happened to walk past again on the way to get some coffee at the cafe down the street. We stopped in again, and what do you know this little guy followed me home! I couldn’t resist. I actually have been thinking about a jointer plane lately, as I’m reading the “The Joiner and Cabinet Maker” from Lost Art Press. Which by the way, is an amazing book, I’ll review it later but for now just trust me on this one. This book is unique and without peer, and is a must buy for any serious hand tool woodworker, or any one who would one day like to pretend to be one. Anyway, back to this lost waif of a jointer plane that followed me home. Actually I’m not giving the old guy his proper due using words like “waif” and “little guy” as its a solid and heavy fellow with a lot of life left in the blade. The bottom is nearly flat at least to the eye, and I only say nearly because I have yet to check it with a square. It’s been pretty well cared for, but it has a few bumps and bruises and the possibility of a minor crack that I think it’s going to affect it much. It’s very solid, and heavy but comfortable in the grip. It’s a user all right. I bought it for two reasons I will admit though, one I’ve mentioned, I might need to actually joint some long boards when I try some of the projects in the “Joiner and Cabinet Maker” book, and the other a bit more sentimental. When I took the class from Roy Underhill at the Woodwright’s School we played with a big old wooden jointer very similar to the one I bought. It was Roy’s pride and joy, and we did a fun “who can make the longest shaving” contest at the end of the night with it. So yeah, I bought it because my woodworking hero had one, but hey it’s also a very useful addition to the shop arsenal! Really. Without further ado… Here is the stout fellow who followed me home. I haven’t cleaned him up yet, but he’ll get a light scrubbing and some oil soon as can get down to the shop. Plus some serious time on the sharpening stone with the blade which looks to be in decent condition with no major dings or nicks.